Many companies believe Active Directory Federation Services (AD FS) is the best choice for applications to integrate with AD. After all, both Active Directory and AD FS are from Microsoft and AD FS is 'free,' so that should be the best choice, right? It’s important to realize that not all Active Directory integration solutions are created equal, and IT departments should examine all aspects of implementation when considering a solution. 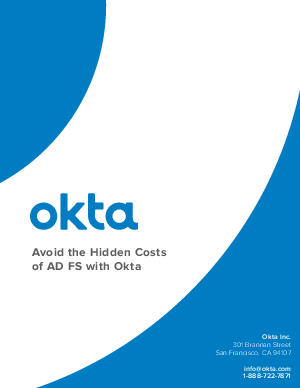 Okta's cloud-based identity and access management service solves these problems with a single integration point that provides a highly available solution for all cloud and web-based application integrations.